Wrapping up my time with Swap This! I couldn’t help but circle back round to the thought that the game manages to fill a void the Nintendo Switch eShop currently has. Small-scale games with a smart device level price. Sure we’ve seen numerous developers bring over smaller titles to Nintendo’s device over the last year (The Room is a recent example), however, the price of entry has always been more than you might see on iOS or Android. Right out the gate, Swap This! already has its cheap price tag going for it, but is the game itself any good? 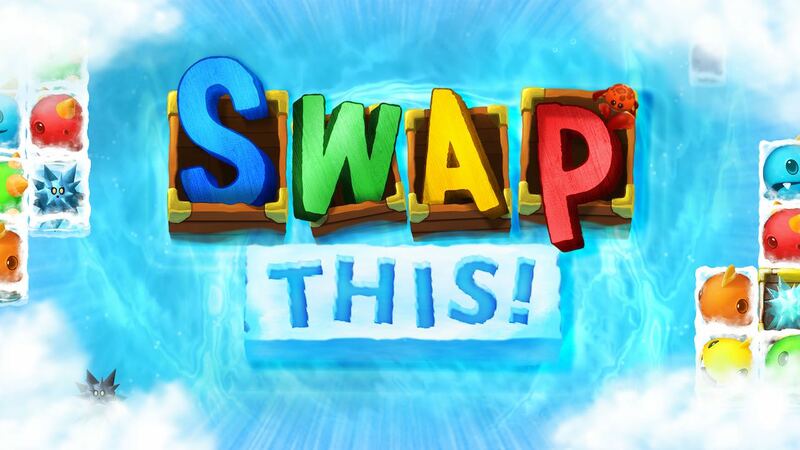 Swap This! is essentially a match-four puzzler. In it, players must free fish from ice cubes by lining up those of the same colour within a larger grid. This can be vertically, horizontally or a combination snaking up down the left and right if you wish. Manage to line up enough frozen fish to create a rift in the grid and those that fall outside will also break free and add to your score. To make things a little tougher sea urchins will occasionally pop up, immune to any matching but dispatched if you can cut them off the grid entirely. Power-ups will also help out in making bigger chains or eliminating unwanted urchins. While the foundation of Swap This! is a sound one, it unfortunately never really escalates or evolves much beyond what you initially see. Tetris, for example, will ramp up the speed at which the Tetriminos drop while something like Lumines will change the music and beat entirely. Swap This! just sort of ticks along and never really ups the ante nor changes things up. That’s not to say this amounts to a boring game, because diving in for a few attempts can be enjoyable. It’s just that enjoyment is somewhat short-lived. The game is broken down into four different modes, most of them focused on making matches as fast as possible. Minute Watch is your default option where you have sixty seconds to score as many points as possible. Wave Mode is probably my favourite, tasking you with freeing a certain number of fish within a time limit to advance to the next round where the target then increases. Fish Fight is all about knocking a giant evil fish down into the depths of the ocean. How do you go about doing that? Making bigger chains quickly. The final mode – Puzzles – is perhaps the most unique, since it doesn’t require you to be fast. Instead, you’ll tackle increasingly difficult layouts, the aim being to completely clear the grid in as few moves as possible. It’s a refreshing alternative that proves especially tough as you get to the harder puzzles. Even with four modes to tackle, Swap This! still feels very feature light. There’s no single player adventure-style mode nor is there any form of multiplayer either. A real shame especially when we’ve seen other puzzlers pull them off so well. It’s not just the modes that feel restrained though. While the game does include leaderboards they’re only local, a huge missed opportunity especially for a game so focused on high scores. The controls are a real head scratcher, playing both portable and docked coming with their own strange restrictions. The former for example is only playable using the touch screen – arguably the better control method to use – with no way to opt for the traditional button and control stick combo. Similarly, slide the console into the dock and you’ll be forced to use the pointer functionality of the Joy-Con. You heard right, even docked you cannot use buttons. It’s a weird omission especially considering how finicky it can be pointing with the Joy-Con. In its defence, the game is very inexpensive, a little over a single pound in fact. Had the game been tagged with a price similar to that of other downloadable games on the Switch then this would have been a much harder sell. Swap This! finds itself in a rare space on the eShop – a relatively simple game that’s incredibly cheap. Swap This! is an adorably cute puzzler that’s quick to pick up but like all smartphone games won’t hold your attention for too long. At less than the price of a cup of coffee though you’ll have a hard time finding a game on the Switch that’s as charming or enjoyable for less.